"WARNING: Completely Non-Humorous Review Ahead." 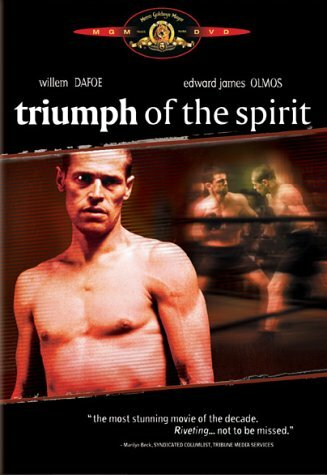 I struggled with the decision to include "Triumph of the Spirit" on The KO Picture Show. While boxing is featured, this is certainly NOT a boxing movie. This is a very serious depiction of the Holocaust based on the real life story of Salamo Arouch, a Greek Jewish former Balkan middleweight champion who was imprisoned in Auschwitz. During his time there he was forced to fight bouts for the entertainment of the Nazis, with execution being the punishment for a loss. It was a horrible existence, and this is something that was expressed very well in this movie based on true events. Willem Dafoe plays Salamo with a sadness and a weariness that permeates the entire movie. And this was another hindrance in my decision to include a review for this movie on the site; I like to write funny reviews. But there was ABSOLUTELY NOTHING funny about this movie. It's an unflinching look at the Holocaust, and it deserves credit as a historical document of sorts in that sense. But does it succeed as a movie? I had written in an earlier review, for "The Boxer", about the dramatic possibilities of a movie's setting. I had mentioned how director Jim Sheridan's tale about boxing in Northern Ireland had a built in drama-generator due to it's setting. But I also mentioned the possibility of a movie becoming overly dramatic due to what I can only describe as a surplus of dramatic contributions. The human element combined with the setting can often result in one canceling out the other or, worse, creating melodrama. "The Boxer" was able to maintain the balance. In the case of this week's movie, the decision to focus so much on the setting made for a pitched field of play. Our central characters, Salamo and Allegra (Gazelle), are presented as lovers during the first 10 minutes of the movie. But this short scene doesn't establish an undying love. So their separation and eventual renunion has no weight. Their incredible hardships in Auschwitz are presented in stark detail, but at no point do we get the feeling that their love for each other is what's keeping them going. It's fear of death, both their own and their immediate family, that seems to be motivating them. But the deaths of Salamo's mother (Zofia Saretok), brother (Costas Mandylor), and father (Loggia) at different points during their imprisonment are overshadowed by the general sadness and cruelty presented here. The daily horrors visited on the screen made me cry for humanity, but made the focus on any specific human in the film impossible. And this was not due to any defense mechanism. This was purely a shortcoming of the film as a cinematic drama. The time spent with Allegra had the added difficulty of a somewhat odd decision to make her sister Elena (Kelly Wolf) a vaguely selfish character. Elena secretly fakes a pregnancy for reasons unknown. Sympathy? More food? A desire to share in her sister's experiences with a lover? It's never made clear. In fact, the women's camp is presented as "every woman for herself", much more so than the relatively harmonious and sharing men's camp. Whether or not this is accurate, the tone was all wrong for this film. The character of the prisoner/enforcer Gypsy played by Edward James Olmos is the one that has the most dramatic possibility. The juxtaposition of his love for his separately imprisoned family and his colorful, faux-joyful cabaret act for his captors, all at the cost of cruelty to the other prisoners is one of the few subtle notes. The idea of saving his family at the expense of others is well presented, but fails to generate any sympathy for his character. In this case, the title of the film seems completely inappropriate. There's a distinct lack of "Spirit". We spend the whole movie anticipating the "Triumph", but it never comes. In fact, "Survival of the Body" would be a more accurate title. While technically proficient, this is NOT a boxing movie. Honestly, Dafoe seems more willing to dole the REAL punishment out than take it during the fighting scenes. But that's the price you pay when trying to capture "candid" fight action. He does a good job of physically portraying a boxer. And the decision to show an earlier, joyous win in the ring made the turmoil of his forced fights in the camp even more poignant. This is one of few subtle touches in what's a relentlessly brutal and unhappy movie. And I have to admit my excitement when I recognized a young Teddy Atlas as one of Salamo's opponents. But that delight quickly evaporated when I realized the fate of his character when he lost. The first movie ever filmed on location in Auschwitz, it's a solemn and graphic portrayal of the events that unfolded there. And for that, it should be viewed and applauded. But as a cinematic drama, it's missing the titular "Spirit". A perfect example of the lack of spirit present in this film is a scene that follows the Gypsy into one of the dark recesses of the camp. Inside this building, the belongings of those that have been executed are being dutifully sorted by prisoners. The Gypsy picks his way through the goods and settles on an odd assortment; a pair of garish white shoes, a bra, a pair of bloomers (I really don't know another name for them. They're women's underpants, circa 1930), and a small teddy bear. We later learn that he's selected these articles as props for the song and dance act that he performs for his Nazi captors. His ability to perform such an apparently joyful act with the props, despite the obviously evil means by which they've come into his possession, shows an ability to disconnect from the situation by means of focusing on the survival of himself and his loved ones. But later we see him making a clandestine visit to his wife and child, and he presents the teddy bear to his daughter as a gift. This is offered as proof that he loves his family. The fact that the teddy bear once belonged to a child who has now been executed is either supposed to be ignored, or presented as evidence of how far the Gypsy has anesthetized himself. The fact that the Gypsy survives until the end of the film is a testament to "numbing" himself to the horrors that surrounded him, rather than any triumph over them. And that is a failure in plot development.